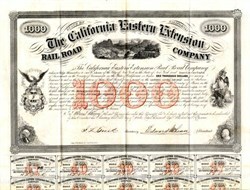 Beautiful uncancelled $1,000 bond certificate #8 from the California Eastern Extension Railroad Company issued in 1859. This historic document was printed by Britton & Co., San Francisco and has an ornate border around it with a vignettes depicting a mountain scene with locomotives. Portrait vignettes of Washington and Franklin at lower corners, sailor and blacksmith at right. This item has the signatures of the Company�s President, Edward McLean and Secretary, J. L. Trask and is over 152 years old. 39 Coupons at bottom. Extremely Fine Condition. The California Eastern Extension Railroad Company was urganized by Theodore Judah. The California Eastern Extension Railroad was to run 15 miles from Lincoln to Auburn, California. The company purchased a townsite near Gold Hill which was to be developed east of Lincoln and travel east to procure materials for the road's construction. When other railroads arrived in California, the company found itself unable to raise the necessary funding for completing the construction.